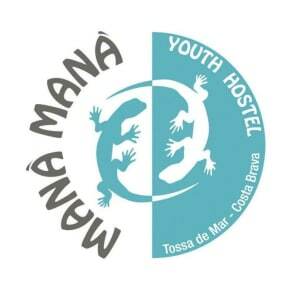 The Mana Mana Hostel is located close to the church square, less than one minute walking distance from the beach, main boulevard and the castle, in the narrow and quiet street Sant Telm. Its perfect location enables you to make the most of Tossa! Come to enjoy holidays with us! If you expect to arrive outside reception opening hours, please inform Mana Mana Hostel in advance. -Bed linen, blankets and internet access are included in the price. -Towels are not included in the price and you can rent them for 2€ for the whole stay. - Late check-outs will be charged with 5€ per person. This does not give the right to spend the night in the hostel. - Check-out after 12:00 will be charged with an extra night plus the deposit. - Check-out after 12:00 without notifying the reception will allow the hostel staff to remove all personal belongings from the room and personal locker. -Guests checking-out before the pre-arranged check-out date will not get refund on payment. -An ID card, driving license or passport will be required at the check-in. -Payment of the entire length of stay must be made at the check-in. An additional refundable cash deposit (not by card) of 10€ per person will be charged. The deposit will be refunded once lockers and bed linen are returned. -We do not accept pets in the hostel. -The hostel reserves the right to refuse admission or to end a stay at its own discretion. -All guests will respect other clients and hostel staff and will be responsible of their own acts during the stay on our premises. -Whenever possible, we will allocate all guests who have made a joint reservation in the same dorm. However, we cannot guarantee that. To make sure that we dispose of the entire room for you and your friends, please contact us before booking. -When booking a bed in a dorm you accept to share your room with other people. If you do not want to share your room with others, you must pay for all the unoccupied beds or book a private room. -Tour operators and agencies must not make bookings through booking engine or our group booking request form. They have to get in contact with us by email. All the information presented in this web site and its booking engine is for individual customers use. To get more information about the group booking (10+ people) please get in touch with our reception staff. The hostel has everything you expect and then everything is really well done. Nice rooms, clean floors/bathrooms/kitchen etc and a rooftop terrace with a great view! The staff makes sure that there is a chill atmosphere in which you can easily meet other travellers and share an awesome time in Tossa! A recommendation! De hostel is modern en heel zuiver. Ook waren er lockers op de kamer en werd er voor elke gast een slot voorzien (met borg). De hele hostel was zeer zuiver, van de kamers tot de douches. Er was echter nagenoeg geen sfeer, dit kan ook niet door hun regels. Ze hebben overal papieren hangen met de regels en de boetes als je deze overtreed. Geen activiteitenboek. Het lijkt het management puur om het geld te gaan.